For princess themed baby showers, one of the sweetest gift ideas is to make a princess diaper cake. Diaper cakes are a lovely way to gift the special mom-to-be plenty of diapers (in the coming months, she can never have too many), while adding a unique personal touch. If you’re wondering how to make a princess diaper cake, then read on. Baby accessories like pacifiers, bibs, teething rings, etc. You’ll need 15 diapers to create the first row of diapers that will make up the base of the castle. Fold the diapers in half, so that the waistband is on the inside. Now stack the diapers one on top of the other, alternating the orientation. So the first diaper has the closed side facing out, and the next will have the open side facing out. Continue to stack the diapers in this fashion. It is important to alternate the direction of each diaper to create even rows. Continue until you’ve lined up 15 diapers in a row. Secure the row with a large rubber band. Repeat until you have three rows of 15 diapers to create the bottom layer of the diaper cake. To create the second layer, reduce the number of Pampers Diapers to 12 in each row. Create two rows of 12 diapers. For the top layer, create one row of 8 diapers. Cover the cardboard cake board in wrapping paper. Stack the rows in a pyramid shape on top of the cake board. Remember, use the three 15-diaper rows as the base, the two 12-diaper rows as the middle layer, and the one 8-diaper row as the top layer. Now, to decorate the diaper cake, tie a wide ribbon around each layer to hold the layer together. Secure the ends of the ribbon with hot glue. Add a thinner ribbon on top of the wide ribbon to create a layered look. To create the turrets, use eight diapers and eight skewers. Roll a diaper around a skewer, and secure the rolled diaper with a rubber band. Cover the rubber band by tying a ribbon around it, and secure the ribbon ends with hot glue. Repeat these steps to create all eight turrets. To create the turret roofs, cut your scrapbook paper into semi circles. Bend the paper into a cone shape, gluing the edges together. Leave a hole at the top, big enough to fit a straw. Make eight of these roofs to fit the top of each turret. To create the final turret, which will sit atop the cake, roll up three diapers and cluster them together. Secure the cluster of diapers with a rubber band, and wrap it with ribbon, securing the ribbon ends with hot glue. Stick a skewer in the middle of the cluster. Finally, create a paper cone large enough to fit the top. To create the turret flags, print out this template onto construction paper, and cut out nine diamond shapes. Wrap a diamond shape horizontally around a straw and close the ends with hot glue. Repeat until you have nine flags. Insert a straw into the top of each roof cone, and fit the cone snugly on top of each turret so that the straw sticks out of the top of the cone, like a flagpole. Finally, it’s time to secure the turrets to the castle. Carefully insert the bottom half of each skewer into the diaper structure. Beautiful! Your princess diaper cake is complete, and it’s a thoughtful gift that the mom-to-be will appreciate. 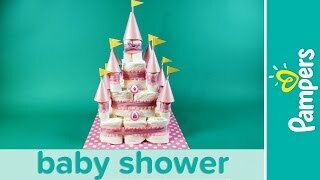 If you happen to be hosting or organizing the baby shower, then watch our guide on princess-themed baby showers. You might also want some information on the perfect baby shower games to entertain your guests on this special day.